It's a good thing the Mubadala Silicon Valley Classic has a deep field. The inaugural tournament at San Jose State lost its third marquee player in three days when second-seeded Madison Keys withdrew today because of a right wrist injury. "I am really sorry to have to pull out of the Mubadala Silicon Valley Classic," said the 12th-ranked Keys. "I have been feeling pain in my wrist over the last couple of days and felt worse today. "This event is one of my favorites, and I was looking forward to playing here in San Jose but want to thank San Jose State University and Mubadala for pulling it together in such a short amount of time. I am excited to come back next year and play in front of your great fans." Keys, a 23-year-old right-hander with a two-handed backhand, had surgery on her left wrist in November 2016 and June 2017. She rebounded to win the Bank of the West Classic at Stanford in August and reach her first Grand Slam final in the U.S. Open. The Bank of the West Classic moved to San Jose this year under a new sponsor. 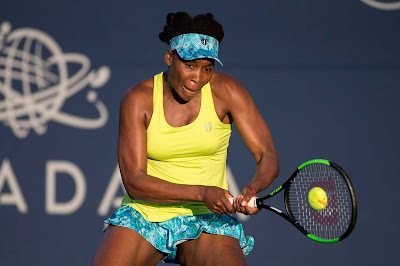 Keys' exit followed sixth-seeded Serena Williams' 6-1, 6-0 loss to Johanna Konta on Tuesday night and top-seeded Garbine Muguruza's withdrawal with a right arm injury on Wednesday. Maria Sharapova, a right-hander, pulled out of her second-round match in last year's Bank of the West Classic with soreness in her left arm and from the Silicon Valley Classic two weeks ago to rest. With the U.S. Open beginning in late August, players are cautious. Third-seeded Venus Williams beat Great Britain's Heather Watson, who won the doubles title in the 2012 Bank of the West Classic with Marina Erakovic of New Zealand, 6-4, 4-6, 6-0 to reach the quarterfinals. Williams, a two-time Bank of the West champion (2000 and 2002) and six-time runner-up, will play Maria Sakkari of Greece on Friday at 7 p.m.
Sakkari, 23, routed eighth-seeded Timea Babos of Hungary 6-0, 6-1 in 56 minutes after dominating Christina McHale of the United States 6-2, 6-2 in the first round. The 14th-ranked Williams, 38, is 2-0 against the 49th-ranked Sakkari, with both matches coming in Grand Slam tournaments. In the players' last meeting, Williams won 6-3, 6-4 in the third round of last year's U.S. Open. The other quarterfinal matchups are Victoria Azarenka of Belarus against Danielle Collins of the United States, Konta of Great Britain vs. fourth-seeded Elise Mertens of Belgium and fifth-seeded Mihaela Buzarnescu of Romania against Ajla Tomljanovic of Australia. Konta won the first of her three WTA titles in the 2016 Bank of the West Classic, defeating Venus Williams in the final. Buzarnescu, a 30-year-old left-hander who reached the fourth round of the French Open in June, eliminated Amanda Anisimova, a 16-year-old qualifier from Aventura, Fla., 7-5, 2-6, 6-1. Tomljanovic, a 25-year-old Croatia native, beat Keys' replacement, 20-year-old Magdalena Frech of Poland, 6-4, 3-6, 6-3. Here are the Mubadala singles and doubles draws and Friday's schedule.